Beauty and love all in a flower that’s enchanted and magical. 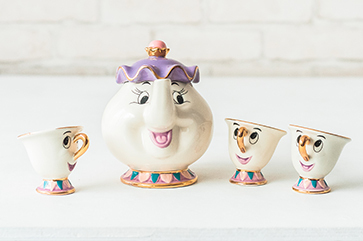 The original ceramic set from the iconic animated film! Bewitched dishes from "The Beauty and the Beast" fairytale are waiting for you on the shelves of our online store. We carefully pack our unique products and ship them worldwide within a period not exceeding ten days. Our tea set is created to exactly replicate the original from "The Beauty and the Beast" fairytale. A magical teatime experience could be yours. Shipping within the shortest time period! Our ceramic products are carefully delivered to you, even in the most remote parts of the world, within 3-7 days. 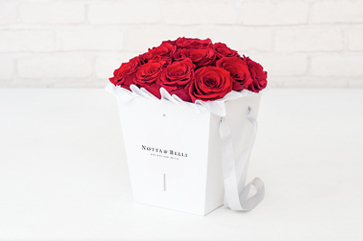 Inspired by the tale of true love, this rose was created to bring love and happiness to those you care about. 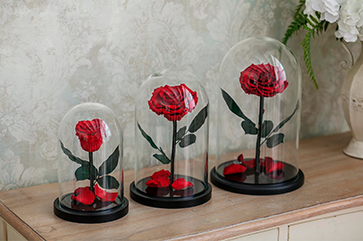 These roses are freshly grown and cut, displayed in a glass dome. Like magic, they will last you years and years to come without any water or sunlight! No maintenance required, you simply place the dome where you’d like the rose displayed and gaze at its beauty. Like in the fairytale, this rose will show those you care about that your love is eternal and stronger than any other. Roses can be gifted to anyone for many occasions to show care and adoration. 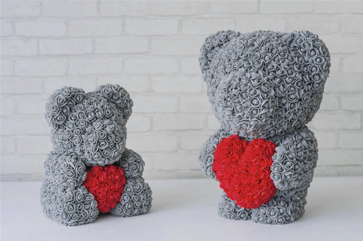 Whether it’s a little princess’s birthday or to celebrate the life of a loved one, these roses are custom and designed especially for who you have in mind. They signify flawless beauty as they last in the display and look as beautiful as the day you got it for many years. Our roses are grown in the best parts of the world, and they are handpicked by our specialists. Once the best roses are picked, they go through a special treatment to allow the rose to remain beautiful and intact. Choose the color and size you want to match the style of who it’s for. There is no need to water these roses, and they shouldn’t be placed in sunlight. You are able to take the rose out of the dome, but be careful with the fragile flower. The roses are as real as your love, and they can have custom engravings to say exactly how you feel. Absolutely everyone will want one when they see the magic it brings. Who wouldn’t want to live their life as the fairytales we see? Bringing this eternal rose to someone brings a piece of that fairytale to their lives, and they will feel loved and adored for as long as they have the beautiful flower. These roses can be placed anywhere in a home or office, privately or on display for all to see. You can be sure that anyone who sees it will want to know all about it, and they’ll certainly envy the love you’ve been given. Magical and enchanted, these roses leave a lasting impression. They inspire and make the person who receives it feel so much more than special. Look through the assorted styles, and pick out the next gift for your loved one or yourself!